Really been wanting to get into some apologetics lately. My pastor loaned this book to me after a discussion. It was a very quick and easy read with loads of evidence and background information on all things Christianity. The author was able to support his case with evidence from all areas of life: archaeology, micro-biology, history, both Christian and non-christian writings/histories, cultural study and other areas. The popular creation vs. evolution debate was covered in GREAT detail with a lot of information challenging and debunking evolution that was new for me. What was amazing to me after reading the book was the amount of information that current culture and media have gotten so blatantly wrong (or have purposely ignored). It's clear that popular society desires to have no belief in God and Jesus after reading this book.Reading as both a study in apologetics and at times a history of Christianity, this is a must read for anyone even remotely curious about the proof that exists today that Jesus was The Word become flesh, that he did die on the cross, that he did rise from the dead, and that Christianity is based on fact. Apart from the Bible, this is the best book I've ever read. Based upon reasoning, and examining archaeological, scientific, statistical and historical evidence, this work is sure to make any skeptic scratch their head and rethink their belief or lack thereof. 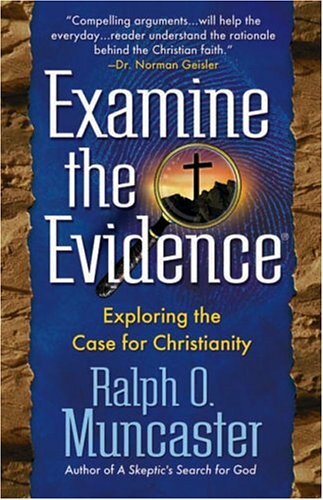 Examine the Evidence is a deep read, especially during the first portion of the book, which deals with the scientific and all the terms, equations and mathematical odds therein. It may be tough for some to wrap their mind around at first, though the author does a good job of summarizing at the end of each chapter.Following the scientific portion dealing explicitly with creation (how we can know there is a God), the book delves into the historicity of the scriptures and of Jesus the Christ (how we can know that the Bible is God's word and that Jesus is the true Messiah).Examine the Evidence is amazing in that it utilizes reasoning to display how one's faith need not be based upon "blind faith," but rather the believer can stand assuredly on solid ground based upon the tangible facts given throughout the annals of time. The author says to question everything, yet I see several gaps in thinking because of the desire to not deal with some inconvenient evidence. This book will attempt to overwhelm you. It uses a rhetoric for its proof of superiority which is self referencing. The incorporation of indisputable facts with conjectures displayed as facts lend him the air of substance without much of the hard through consistent logic he espouses. This book attempts much - and as a result the authors is often out of the comfort zone of true, through and through comprehension at points.